OTTAWA - Hundreds of supporters of a Canadian pastor serving a life sentence in North Korea are to demonstrate on Parliament Hill today to urge the government to press for his release. 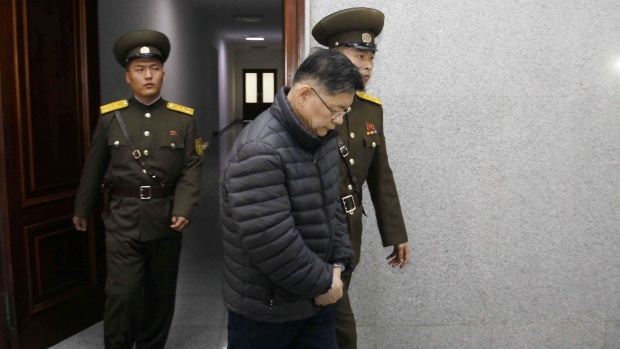 Hyeon Soo Lim, a pastor with the Light Korean Presbyterian Church of Mississauga, Ont., was sentenced by a North Korean court to life in prison at hard labour for what it called crimes against the state. Among other things, he was charged with harming the dignity of North Korea's supreme leader and trying to use religion to destroy the country's system. Last month, CNN was granted extraordinary access to Lim and broadcast a televised interview in which he described his eight-hour-a-day, six-day-a-week regime of hard labour and said his North Korean jailers had yet to honour his request for a Bible. Richard Ha, a spokesman for his church, told The Canadian Press that Lim steered clear of politics on previous trips to North Korea. He said he was focused on helping orphans and others living in poverty. "It's just his heart," said Ha. "Having a heart for the people of North Korea and wanting to help in any way that he can - he's driven by his faith." Ha said about 300 supporters will hold a prayer vigil on the lawn of Parliament Hill today, calling on the government to take more action at a higher level to ask for his freedom. A petition with 165,000 signatures calling for his release will also be highlighted. "What started as a petition by two Edmonton women has grown into a global movement that has secured the support of tens and tens of thousands," said Kathryn Semogas, the Canadian spokeswoman with the petition platform Change.org. Foreign affairs critic Tony Clement is to hold a news conference on the Hill as well to urge more action. Ha said Lim's family and his congregation are grateful for everything Canada has done so far to try to win his release, but they want to bring attention to his cause. At the same time, they are also walking a fine line and don't want to do anything to anger North Korea's leadership. The hermit kingdom, cloistered from the world, is pursuing a nuclear bomb while many of its civilians starve. Lim, who turned 61 on Tuesday, needs medication to control his diabetes, said Ha. Ha said Swedish diplomats in North Korea have been allowed to bring medication to Lim in prison, but to his knowledge he has been denied all other visits. Canada, like many countries, does not have an embassy in North Korea, and has advised against all travel there. Lim has a wife and adult son living in the Toronto area. Lim told CNN that his faith has not been shaken, and he continues to pray. "Nobody knows if I will ever go home, but that is my hope. I miss my family. I am longing to see them again, and my congregation," he said.